Like the past few years 2017 also saw a slew of SUVs get launched in the country. And I'm not even surprised my first review in the new year is that of an SUV, the all-new, 2018 Audi Q5. It is Audi's first launch this year and also probably its most strategic one. When it was launched in India originally in 2011, the Q5 was welcomed with open arms by buyers and was quick to succeed in the then nascent midsize luxury SUV segment. It propelled Audi India to the top of the luxury car game and considering that 2017 wasn't the best of years for it, Audi is keen on getting right back into the numbers game. We got a little taste of the second generation Q5 on Indian soil, after our exclusive drive earlier this year in the UK, and here's what we think. The Audi Q5 needs no introduction as one of the most popular midsize luxury SUVs. 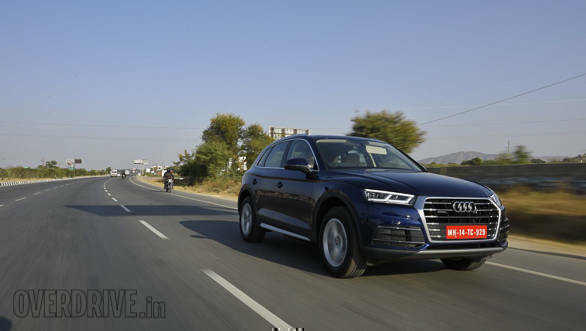 The last generation model also performed excellently in terms of bringing in crucial volumes and helping Audi India clock its best annual sales numbers and breach the 10,000 units mark in 2013. The 2018 Q5 is a full model change and will compete with the new generation BMW X3 (also launching soon, at the upcoming 2018 Auto Expo), the new Volvo XC60 and the Mercedes-Benz GLC in India primarily. To remind you, the Q5 slots in between the Q3 and Q7 in Audi's line-up and is a five seater SUV. The 2018 Audi Q5 doesn't look radically different from the outgoing version. Audi has gone in for an evolutionary approach and viewed from the front three-quarter the new Q5 looks very similar to the outgoing version, especially with its curved roofline. The resemblance to the Q7 is unmistakable when viewed head on, particularly with the one-piece, squared-off grille and headlights. The LED DRLs deserve a mention too  daytime running lamps have always been a highlight on Audi's cars and the trend continues with the new Q5. The all-LED headlights offer brilliant illumination, something I discovered while passing through the bylanes of Pushkar in Rajasthan well after sunset. The tail lights look similar to the older Q5's at first glance but look closely and you will appreciate the intricate design of the LEDs. The sharp crease joining the tail lights is new and adds a sense of novelty. On the whole, the second generation Q5 boasts a tauter, more compact appearance, though it remains to be seen whether or not buyers will like the similarity to the older version. I for one think the Q5 now wears a sharper, custom made business suit as compared to the older one that had basically walked into a readymade store and picked a suit for itself off the shelf. The air of familiarity continues inside, particularly thanks to the steering wheel, air-con vents and not to forget, the massive 12.3-inch display for the instrument cluster. Its switchable views and large-screen format for navigation make it fantastic to look at and use on the go. The dashboard doesn't get the Q7's faux vents across its length but the 8.3 inch display sits atop the dashboard to offer a premium feel. 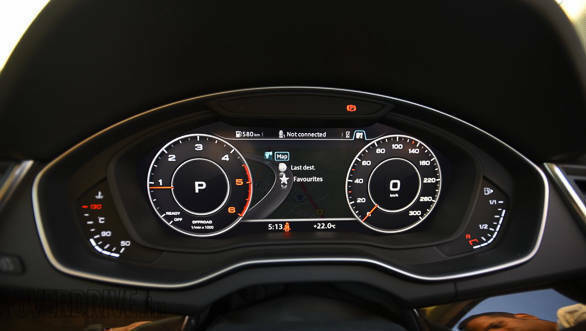 The resolution is excellent though this is no touchscreen  Audi still wants you to use the rotary knob on the centre console and that is a good thing as it means less distraction on the go. There's an MMI scribble pad with 8 short cuts as well  all to make using the screen easier, particularly when using the in-built navigation. The seats are plush and comfortable, but only the driver's seat gets a memory function. Thankfully, floor mats are not beige hued like the seats and won't look soiled too soon with their dark colour. Another highlight is the massive panoramic sunroof. Sunroofs have become the norm these days and the Q5's unit adds to its cabin's airy feel immensely. There's ample leg and kneeroom in the second row apart from which the rear seatback can be reclined slightly too, adding to the comfort. Boot space stands at 550 litres and folding the rear seatback will liberate an additional 1,000 litres for you. 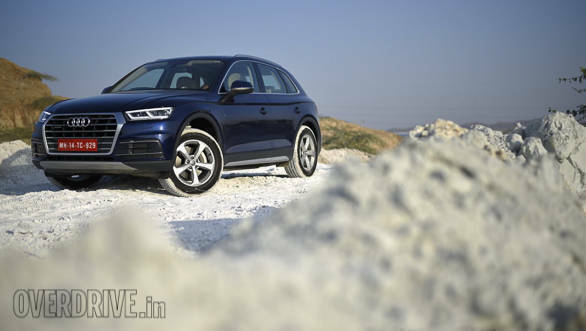 For now, the new Q5 will only be powered by Volkswagen Group's inline four cylinder, 2.0-litre diesel engine in India. The Q7's 2.0-litre turbo petrol and 3.0-litre V6 are expected to be offered later. The 2.0 TDI is all-new and debuted on the A4 last year. It offers 190PS and 400Nm, and peak torque is available from just 1,750rpm! The resultant power delivery is urgent, uncharacteristic to oil-burners while the engine is very quiet and smooth. 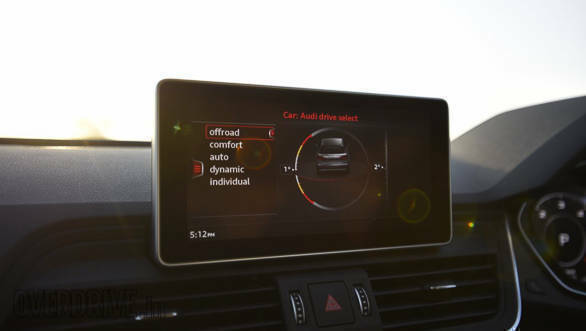 Nudge the throttle slightly and it is quick to respond with brisk acceleration  Audi is claiming a 0-100kmph acceleration time of 7.9 seconds which is quick for a near 2-tonne SUV. Also responsible for that is the SUV's weight loss regime that has made it 65kg lighter. 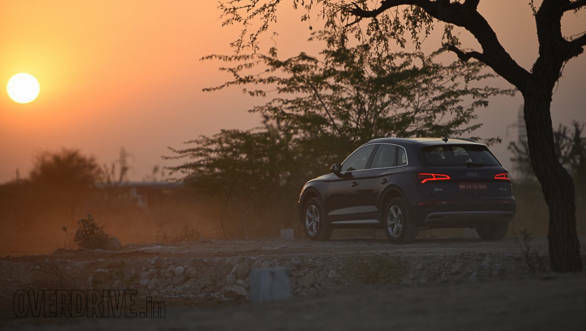 Rajasthan's deserted, smooth roads helped the Q5 gobble up miles easily and progress was quick. Credit for the engaging feel from behind the wheel also goes to the 7-speed S tronic dual clutch transmission that's extremely quick and intuitive when it comes to swapping ratios. Gear changes are seamless and the transmission does its job very well. ARAI certified fuel efficiency stands at 17.01kmpl, which is impressive given the engine performance. 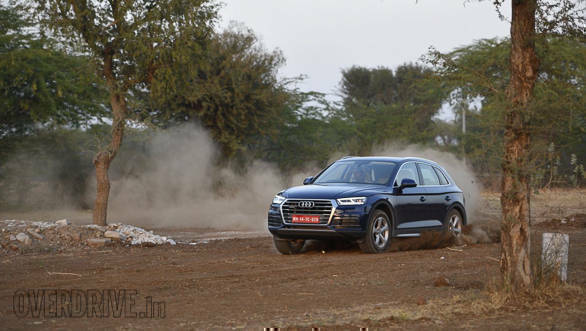 The Q5 features Audi Drive Select now  being an SUV it also gets a dedicated off-road mode that tailors engine performance to suit driving off tarmac better by dulling throttle response and improving traction with Quattro. 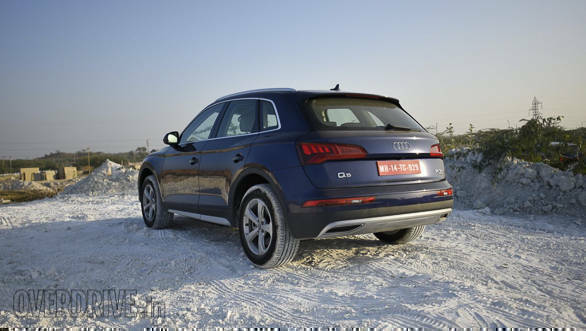 Quattro also helps the Q5 put its power down better, thereby enabling better acceleration and improving grip levels. Most importantly, it features adaptive suspension now that gets tauter in Dynamic mode to aid handling but offers a plusher ride in Comfort. Steering feedback has improved too as it offers a more connected feel when chucking the SUV around and I have to say the response has come a long way from what it used to be. Our drive was rather short but helped me understand that the Q5 is now far more engaging to drive. The improved engine performance coupled with the responsive transmission and sportier handling help it feel far more competent than the Q5 ever was. I'm also impressed with the adaptive suspension's ability to soak in bumps and I feel the new Q5 will tackle broken roads better. I was surprised to note that the new Q5 is longer, wider and taller than its predecessor, as the styling made me think otherwise. 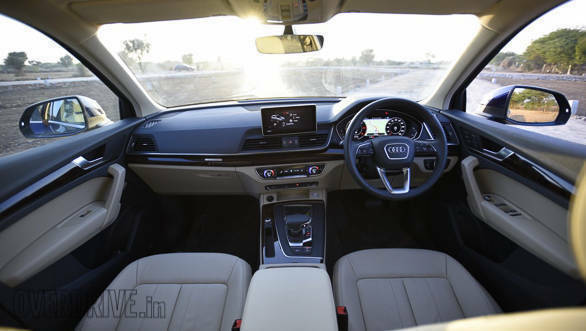 The interiors feel roomy and the Q5 also feels quieter inside thanks to improved cabin insulation. Given its positioning the Q5 gets a host of features as standard now, including three-zone air-conditioning with the haptic switches we first saw on the A4 and dedicated controls for the rear blower and temperature settings. The air-conditioning system will also detect which part of the car is getting direct sunlight or humidity and adjust cooling accordingly, a nice feature for our country. The electrically powered tail gate is standard, while the key fob has gotten intelligent and can remember your preferred settings for the driver's seat, ORVMs, air-conditioning, drive mode and multimedia connectivity. The Q5 gets wireless phone charging too, a feature iPhone users can finally use! On the safety front there's 8 airbags while on the convenience front the Q5 gets Audi's park assist system along with a 360-degree camera. There certainly is a lot to like about the new Q5. It ups the game in the midsize luxury SUV segment with its richer feel and sportier manners and not to mention, all the technology it packs in. It still looks slightly understated but with an air of elegance that's sure to appeal to the business class of luxury SUV buyers. 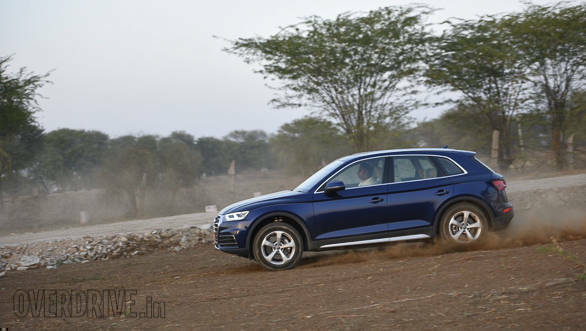 The diesel engine is better than ever before and makes the Q5 very engaging to drive. 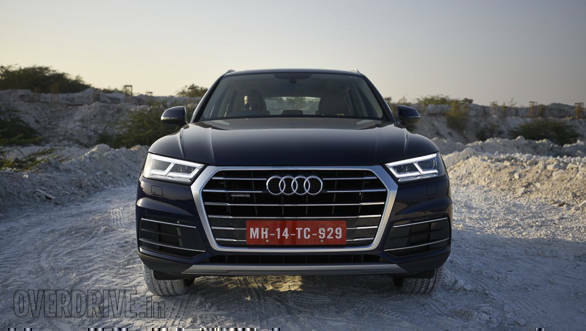 The 2018 Q5 has been priced at Rs 53.25 lakh for the Premium Plus version while the fully-loaded Technology version retails at Rs 57.60 lakh ex-showroom, which sounds about right for what the new Q5 brings to the table. But with that said, the Q5's arch nemesis, the BMW X3 will also get launched in an all-new avatar shortly. Also let's not forget that the Mercedes-Benz GLC is reasonably new, while the Lexus NX300h and new Volvo XC60 have just arrived. 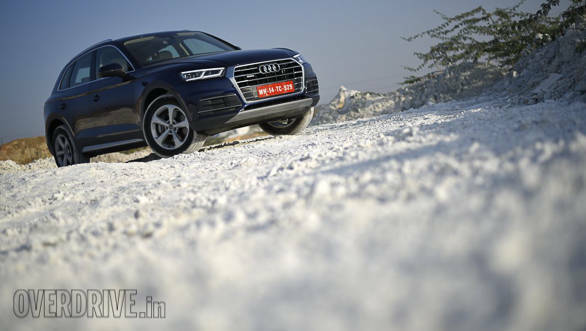 Clearly, the Q5 has its task cut out in the midsize luxury SUV segment this time, though there is no denying it has come well prepared.